A review of Wes Davis’ recently published book by Alexander Clapp. On May 27, 1941, days after the first airborne invasion in history, the German army hoisted a Nazi flag atop an abandoned mosque in Hania, western Crete. The gesture was poignant. Crete – which had overthrown three centuries of Turkish rule just three decades prior – was again under the heel of an occupying power. The Cretans were unshaken. The island’s peasantry armed itself with muskets and daggers and took to the crags and caves of the White Mountains. The campaign of sabotage that followed – an echo of repeated revolts against the Ottomans, Venetians and Arabs – marked the first mass civilian resistance to Nazi rule in Europe. “We had encountered for the first time an enemy that was prepared to fight to the bitter end,” marveled a German lieutenant. Wes Davis’s “The Ariadne Objective” (Crown, 2013) traces the British intelligence service’s collaboration with this hardscrabble fifth column. The plans to wrest Crete from Nazi control formed part of a larger wartime strategy to “set Europe ablaze” through the Special Operations Executive (SOE), “Churchill’s secret army.” In Crete the stakes were particularly high. Cretan restlessness proved crucial to delaying Hitler’s march to the East. As the war in North Africa came to a close, the island was to become a strategic linchpin to the European theater. By 1943, the British naval command looked to Crete as a promising base from which to retake the Aegean and the Continent at large. “The Ariadne Objective” distills existing accounts of the Cretan conflict – W. Stanley Moss’s “Ill Met by Moonlight,” George Psychoundakis’s “The Cretan Runner,” Antony Beevor’s “Crete” – into a thrilling, highly readable narrative. The book benefits from a remarkable group of protagonists. Just as the Greeks of 1821 attracted a spirited cast of Western philhellenes, so too did the Cretan resistance become a curious meeting ground for a platoon of Anglophone scholars. Most were Classicists who had scraped together the rudimentary basics of Modern Greek. Many – N.G.L. Hammond, Thomas Dunbabin – went on to hold distinguished academic posts after the war; others – Evelyn Waugh, Lawrence Durrell, Patrick Leigh Fermor – were to become the literary giants of their generation. “It was the obsolete choice of Greek at school which had really deposited us on the limestone,” recalled Leigh Fermor. Davis weaves in and out of these figures’ fascinating back-stories. The book narrates Leigh Fermor and Xan Fielding’s respective hikes across Europe in vivid detail; the one-eyed Cambridge archaeologist John Pendlebury provides an excursion into the British excavations at Knossos; a chapter on life in wartime Cairo – including a detour into the rowdy antics of the “Tara villa” inhabitants – acts as a kind of comic relief from the grittiness of the Cretan front. This thinking was not entirely unfounded. Some Cretans chose to collaborate with the Germans against their countrymen. Those who did resist were internecine and uncertain of their objectives. The available weaponry was hopelessly antiquated. “Stand still, Turk, while I reload” was still the threat of choice among the elderly fighters. On April 26, 1944 Patrick Leigh Fermor, W. Stanley Moss and a team of Cretan partisans abducted the German commander of Crete, General Heinrich Kreipe, from his headquarters at the Villa Ariadne in Iraklio. 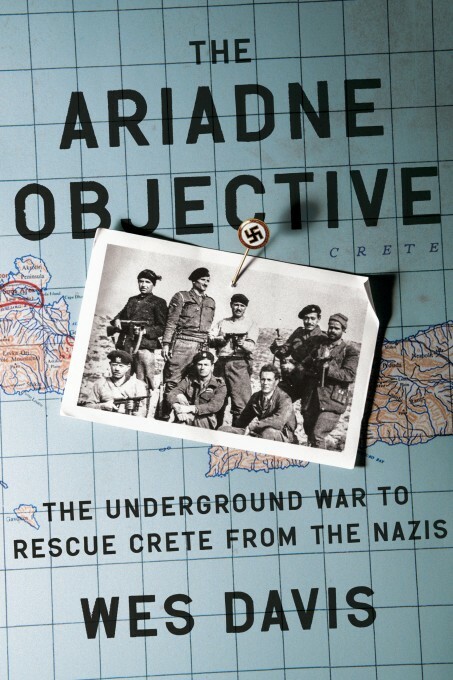 Passing through 22 enemy checkpoints, the team worked their way to the southern coast of Crete, sheltering in caves by day and evading German search parties by night. By May 15 Kreipe was in Alexandria; two weeks later he was a prisoner of war in Canada. An intriguingly highbrow current runs through the book’s otherwise soldierly narrative. Greece was not merely a shared strategic prize for German battalions and British spies; it was also an intellectual middle ground for two competing nationalisms, each of which claimed the cultural mantle of the Classical world as its own. Evidence of this mutual enthrallment to antiquity resurfaces throughout “The Ariadne Objective.” The German invasion of Crete is code-named “Mercury.” The British cruisers stationed in the Eastern Mediterranean are named the Orion and the Dido. Shipping out to the front line, Pendlebury reads Edward Gibbon’s “Decline and Fall” for a crash course in military strategy. Following their conquest of Crete, the Germans import their archaeologists to tend to the island’s historical sites. The diary entry of a German commander flying out of Crete: “just as Daedalus had done so many centuries ago.” “Minotaurs, bull-men, nymphs of Ariadne, kings of Minos, and German generals – a splendid cocktail!” writes Moss after abducting Heinrich Kreipe. The most arresting example comes a few days following the general’s capture. In a well-cited incident on the slopes of Mount Ida, Kreipe quietly quotes the opening lines of Horace’s “Soracte” ode. Taking up where the general had paused, Leigh Fermor, Kreipe’s captor, recites the rest of the poem’s 24 lines. “It was a reminder that the war itself was the aberration, interrupting something far more important and lasting. The moment of connection he and the general had just shared had sprung from a deep-running current of literature, art, and civility,” notes Davis. The incident – like much of the clash in Crete – represents a strange last flowering of the world of the 19th-century imperialist scholar. “The Ariadne Objective” examines that story ably and admirably. This is necessary reading for anyone interested in Greece in the Second World War. This entry was posted in Paddy's Friends, Uncategorized and tagged Crete, Greece, Ill Met by Moonlight, Major General Heinrich Kreipe, Patrick Leigh Fermor, William Stanley Moss on April 15, 2014 by proverbs6to10. Waugh arrived in Crete with “Layforce” and was evacuated with it shortly before Crete fell. He had no later connection with British activities on the island that I have read of. The Commonwealth forces’ resistance may have delayed Germany’s invasion of Russia: the subsequent Cretan resistance can hardly have begun to get organized between May 30 and June 22. In fact, it is hard to see what effect the Cretan resistance, gallant as it was, had on the later course of the war. During one of John Mosby’s raids in the American Civil War, he captured some hundreds of horses, and a brigadier general. Abraham Lincoln is quoted as regretting more the loss of the horses, on the grounds that he could make a brigadier general any day. Was the value of this German general an equivalent for the reprisals that must have followed?